Born in Paris to Caribbean parents, Pascal Danae has traced his intuitive love of the blues back to his ancestral home of Guadeloupe. 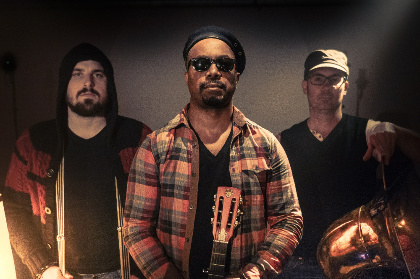 He’s named his trio project after Louis Delgrès, the officer of African descent who gave his life on the island fighting against Napoleon’s enforced reinstatement of slavery in 1802. Repression and exile for many followed, some fleeing to Louisiana. What contribution those Afro-Caribbean exiles made to the birth of the blues is the missing link question that fires Pascal’s imagination. 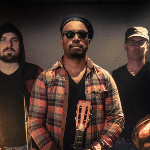 Through an old Dobro guitar, accompanied by Raphaël on that stalwart instrument of New Orleans marching bands, the sousaphone, and perfectly funky drumming from Baptiste Brondy, he channels the voices of his ancestors, manifesting retrieved memories of the roots and the routes of the blues.